Photograph collection of Ian Hammond Six years of handling freight traffic in the Midland's ended for 7503 in January 1972 when it was transfered to Laira. It would not remain here long, by October 1972 it had moved north to Cardiff. In this undated view with a freight at Exeter St Davids 7503 has gained its TOPS number - 25153, dating the view sometime after 1974/75. The high level decision to withdraw the Western Region diesel hydraulic fleet required their replacement by a variety of other locomotive classes. Transferred to Laira between 1971 & 1980 were a total of forty five different Class 25's as part of this purpose - some stayed only very briefly whilst at least two of those locomotives transferred in from the beginning stayed almost until the end. This major reorganisation which brought the Class 25's to Laira occurred at the end of the summer timetable in October. The first Class 25's to be transferred totalled ten and were 5180, 7573-7575, 7577, 7656, 7657, & 7675-7677, a mixture of boilered and non-boiler equipped locomotives. All were transferred in from LMR depots except for 5180 & 7657 from Cardiff. Class 25 No.5179 at Laira during the late summer of 1971. Although 5179 was never allocated to Laira, it was one of the first to arrive in the area for crew training. The photograph also reveals some of the architectural features of Laira shed. The end of July saw the Class 25’s make their first appearances in the West Country, to replace the NBL Class 22’s, similar in nature to the Class 25's introduction to the South Wales area during December 1970. On July 30th 5180 was noted arriving at St Blazey, followed by 5179 on August 19th, bound for Laira. With these machines, and later 5181 and 7657 (September 3rd) crew training commenced. There still remained thirteen Class 22’s 6308/19/22/26/30/33/34/36-39/43/56 with ten diagrams to cover. The St Blazey turns visited St Dennis Junction and the Retew branch, Tavistock Jcn and Boscarne, Goonbarrow Jcn, Drinnick Mill and Lostwithiel and the Truro area. Laira turns went to Keyham and Liskeard, Plymstock and lastly Devonport. The Newton Abbot locomotive visited Heathfield and Stoneycombe. Exeter turns went out to Barnstaple Junction and Torrington, Tiverton Junction, Hemyock and Chard Junction. The last turn ran out to Okehampton. A number of these turns were not daily. Warship D827 hauled D7676 and D7677 from Bristol Bath Road to Laira, departing at 15.00 on Sunday 3rd October 1971. Exeter Central, believed to be sometime during 1971. Time is running out for the WR hydraulics, but in this view the sun shines on both the usurper & the usurped for a little while longer. Also of interest is that Beyer Peacock built all the Hymek Class 35's and a small batch of Class 25's. And if the Sulzer R series engine had been fitted to D5299, how would it have compared performance wise to the Hymek? Exeter St Davids, most likely sometime during 1970. If the increasing use of the Class 45/46/47's in Devon & Cornwall meant the end of the Warships & Westerns, so it was that the arrival of the Class 25's spelt the end for the NBL Class 22's. In this fine view 6348 enters Exeter St Davids on a special working. 6348 was withdrawn during July 1971, this was at the time that the first Class 25's were arriving at Laira. On October 5th St Blazey received 7575 & 7676 for taking up further Class 22 duties, unfortunately 7575 was defective and returned to Laira for repair. Its replacement was 5180, these two handling the trips to Dennis Junction, Retew and Goonbarrow Jct. During the last quarter of 1971 the few Class 25’s present were working alongside the dwindling Class 22’s. There were still not enough Class 25’s available to retire the hydraulics, the Class 25’s were still not cleared for the Drinnick Mill branch and crew training was still continuing. Part of the shortage was due to 7573 spending a month out of service before being moved to Laira for repair and the use of Laira based 7574 at Bristol for crew training. One of the Laira turns involved the 05.55 Keyham – Liskeard and related trips, it then assisted the 22.20 Presflos from Plymouth to Newton Abbott before returning west in the early morning hours with the Severn Tunnel Junction – Plymouth car train. One stationary task for a boiler equipped locomotive, frequently a Class 25, at Exeter in the 1970's was heating the sleeper. In those days the 21:05 Penzance - Paddington (depart Exeter 01:42) and the 23:45 Paddington - Penzance (arrive Exeter approx 04:30) conveyed a single sleeper that was attached/detached at Exeter St Davids. At about 10:30 every night the sleeper would be put into platform 6 by the stairs and the locomotive would steam heat it until about 01:30. With a Class 25 ticking over for three hours the stairs and overbridge soon became thick with engine fumes. A similar thing happened with the down train. On January 3rd 5180 had the unfortunate task of removing the last active Class 22’s from the south west. 6336 & 6338 left St Blazey in the early hours, collecting 6333 & 6339 at Exeter for the run to Bristol Marsh Junction. It would not be long before the sight of Class 25’s at Penzance and all the Cornish branches would be a very common sight. Arriving in January were 7502-7509, these were all ex-Midland machines and were partially used to replace 5180, 7656, 7657, 7676 & 7677, which were transferred out to other Western Region depots, principally Bristol & Cardiff. With effect from May 1st the information below covers the Exeter/Barnstaple/Newton Abbot area trips under Target 7B70 (LA 92) Monday - Friday. Class 25's were booked for this diagram, though Classes 35 and 42 could also be turned out for these trips. Exeter / 0B15 02.45 Exeter S.P. - Exeter / 6B15 03.00 Exeter - Barnstaple / SHUNT as required / 4B99 07.20 Barnstaple - Exeter / Exeter S.D. / 8B71 09.20 Exeter Riverside Yard - Exmouth Junction from Exeter to Exeter Central banking Train Engine / 0B58 09.40 Exeter Central - Exeter Riverside Yard / 8B70 10.05 Exeter Riverside Yard - Exmouth Junction banked from Exeter to Exeter Central by DIA. 385 / 0B58 10.40 Exmouth Junction - Exeter / Exeter / 0B70 12.55 Exeter - Exeter Riverside Yard / 8B70 13.15 Exeter Riverside Yard - Hele & Bradnich 'Milk empties' / SHUNT as required / 7B70 14.23 Hele & Bradnich - Tiverton Junction 'Milk empties' / SHUNT as required / 7B70 15.34 Tiverton Junction - Hemyock 'Milk empties and freight' / SHUNT as required / 7B70 16.57 Hemyock - Ulfculme Exeter 'Milk and freight' / SHUNT as required / 7B70 17.38 Ulfculme - Exeter Riverside Yard 'Milk and freight' / 6B70 18.54 Exeter Riverside Yard - Exeter 'Milk' / 0B70 19.05 Exeter - Exeter S.P. / Exeter. Monday - Friday	Exeter / 0B15 02.45 Exeter S.P. - Exeter / 6B15 03.00 Exeter - Barnstaple / SHUNT and TRIPS as required / 6B24 16.35 Torrington - Barnstaple 'Milk' / 6B24 17.20 Barnstaple - Lapford 'Milk' / SHUNT as required / 6B24 19.07 Lapford - Exeter 'Milk' / Exeter. Saturday only	Exeter / 0B22 12.50 Exeter S.P. - Exeter / 6B22 13.05 Exeter - Lapford 'Milk empties' / SHUNT as required / 6B22 14.08 Lapford - Torrington 'Milk empties' / SHUNT as required / 6B24 16.35 Torrington - Lapford 'Milk' / SHUNT as required / 6B24 18.40 Lapford - Exeter 'Milk' / Exeter. Monday - Friday	Exeter / 0B19 04.15 Exeter S.P. - Exeter / 7B19 04.30 Exeter - Lapford 'Milk empties' / 7B19 05.35 Lapford - Kings Nympton / 7B19 06.14 Kings Nympton - Barnstaple / 8B70 08.50 Barnstaple - Torrington / SHUNT and TRIPS as required to MEETH & MARLAND / 6B70 12.20 Torrington - Barnstaple / SHUNT as required / 6B70 15.00 Barnstaple - Torrington / SHUNT as required / 6B24 16.35 Torrington - Barnstaple / SHUNT as required / 7B67 19.10 Barnstaple - Exeter Riverside Yard 'Vans and freight' / SHUNT as required / 7B67 20.50 Exeter Riverside Yard - Exeter 'Vans' / Exeter. Saturday only	Exeter / 0B19 04.15 Exeter S.P. - Exeter Riverside Yard / 7B19 04.30 Exeter Riverside Yard - Lapford 'Milk empties' / 7B19 05.35 Lapford - Kings Nympton 'Milk empties' / 7B19 06.14 Kings Nympton - Barnstaple / SHUNT as required / 7B66 10.40 Barnstaple - Exeter Riverside Yard (Dep. 11.02 SUMMER SATURDAYS ONLY) / 0B66 12.40 Exeter Riverside Yard - Exeter S.P. / Exeter. Saturday only	Exeter / 0B70 13.48 Exeter - Exeter S.P. / 6B70 14.35 Exeter - Tiverton Junction 'Milk empties' / 6B70 15.10 Tiverton Junction - Hemyock 'Milk empties' / SHUNT as required / 6B70 16.45 Hemyock - Tiverton Junction 'Milk' / 6B70 17.38 Tiverton Junction - Exeter 'Milk' / 0B70 18.05 Exeter - Exeter S.P. / Exeter. 7508 & 7506 at St Austell with a short train of milk tanks, date unknown. 7508 was only allocated to Laira between January & December 1972, so it is presumed this view is from 1972. May 2nd's 6B86 St Blazey - Drinnick Mill freight with 7574 leading and 7505 in the rear became derailed between St Blazey & Par, the locomotives remained on the track. An interesting summer Saturdays diagram operating on the Western Region brought double headed Class 25s to Cornwall between May 6th and September 23rd. The diagram started with the previous day's 7B34 19.40 Bristol Temple Mills - Ponsandane freight, leaving Plymouth at 02.05 and arriving Ponsandane at 07.13. They were then booked to work the 1E21 10.30 Penzance - Bradford service to Plymouth arriving at 12.30, light engines to Laira and then the 7B31 18.20 Plymouth Friary - Par freight. Following the failure of the dmu on May 15th’s 13.55 Exeter – Barnstaple and 16.10 return 7508 was attached, however the diesel also failed before taking out the 17.40 to Newton Abbot, a fresh dmu being provided. On June 10th the through Paddington – Barnstaple service was hauled by 7573 & 7647 beyond Exeter. This was at a time of a serious shortage of motive power in the west, a number of Hymeks & Warships having been reinstated to cover the shortages. During the summer months several Class 25's transferred away, 7675 in May, 7509 in July and 7503, 7504 & 7577 during October. Again these transfers out were to either Bristol or Cardiff. On August 17th the Barnstaple – Exeter Riverside freight was powered by 7624 and 7038 & 7085, the two Hymeks had been used for bridge testing on the Meeth branch. On September 2nd front line duty befell 7574 & 7575 when they were noted leaving Penzance in charge of the ‘Cornishman’, presumably caused by a shortage of Type 4's. I never had the pleasure of this route behind a pair of Type 2's, but now with the Type 2's operating this far west it was in theory quite possible to travel from Penzance to Wick throughout behind Sulzer powered locomotives, and if good fortune was with you the journey segments might be made entirely behind Type 2's. Laira held an Open Day on September 23rd, amongst a variety of exhibits were 163, 7506 & 6544. A notable long distance working for pairs of Class 25’s into the area was the Hope (Earles Sidings) – Exeter Central cement, on 23rd 7501 & 5239 were in charge of this. Class 31’s were now also passed for workings to Barnstaple, Torrington and Meeth. A revision of the workings in the Penzance area led to better turn round time for locomotives there, a Class 25 was available for duties from 11am to 3pm prior to its return east on the 15.25 to Exeter Riverside freight. Further refinements included a St Blazey Class 25 working light to Truro for the 04.30 round trip freight to Falmouth, coming back from Truro on the 07.28 to St Blazey. Then it was off to Drump Lane for the 10.05 to Penzance, the Hayle Wharf trip, the Drump Lane shunt, Chacewater cement traffic before ending with the 17.44 Drump Lane – Truro and 19.08 Truro – St Blazey. Nightime working for a pair of Class 25’s included the 20.44 Par – Plymouth Friary, returning at 22.35 to Truro, then light to Par for the 02.45 to St Blazey. The arrival of six Class 46’s at Laira did not bode well for the four remaining Warships, though the newly arriving Peaks were intended for stone train workings. Even with the help of 7502 a damp day, October 31st 1972, presents a challenge to Class 45 No.120 and its train of coal bound for the coal concentration depot at Exmouth Junction as they climb the 1 in 37 bank up to Exeter Central. 7502 was allocated to Laira from January 1972 to October 1972. New arrivals in December were 7624, 7625, 7656 & 7675-7677. These were to replace 7502, 7505, 7507 & 7508 - all these transfers were internal within the Western Region. A sign of the times found Laira without any Warships on shed, its last – 821 ‘Glory’ headed east on May 24th. Even worse for the hydraulic fleet was the withdrawal of the first Class 52’s, 1019 & 1032 during May, being dumped at Laira. During 1973 there were no new Class 25 arrivals, but several were transferred away, 7625 in May and 7506 & 7624 in September, again these were transferred away to other Western Region sheds. Five Class 25s’ were required for local jobs in Cornwall, being needed for trips to Drinnick Mill, Goonbarrow, St Dennis Jct, Boscarne Jct, Falmouth Goods, Penzance pilot (morning only), Hayle Wharf. Drump Lane & Truro were handled by the daily Penzance – St Blazey freight. Liskeard, Burngullow & Carne Point were handled by a Tuesday – Friday diagram. In the Exeter area two Class 25’s worked turns to Torrington & Barnstaple, in the evening they were combined at Exeter to handle a stone working to Westbury, where after refuelling they return to Exeter with a return working. The 08.00 Bristol – Plymouth passenger on November 22nd was noted west of Exeter behind 5230 (failed?) and 400. Exeter was also host to foreign Class 25’s (& 31’s) arriving with sugar beet from the ER, 7626 was noted on 1st, 25031 (2nd) & 5251 (6th). Western Region internal transfers in March to Laira were 7588, 7624, 7625. 7588 did not remain long, by May it had been transferred back to Cardiff. Another reallocation in May was 7675, sent away to Cricklewood, the first of Laira's fleet to transfer away from the Western Region. The afternoon 4B10 16.00 Bristol – Plymouth parcels gained a reputation for unusual combinations of motive power, perhaps the result of a dead head move, on May 2nd it was hauled by 7588 & 1064! It was a Bristol turn and arrived at Plymouth at about 19:30 and then piloted the 18:00 Penzance - Bristol back to Bristol. 25080 was called upon to rescue 50042 and its train at Taunton on June 15th after the Class 50 became a total failure. Departure was over an hour late, no doubt the climb up Wellington Bank challenged the Class 25, though Exeter had a substitute locomotive on arrival! Unusual visitors to Exeter on September 5th were 25083 & 25002 on the morning freight from Bescot. Five days later sister machine 25022 failed at Uffculme whilst working the Hemyock milk tanks, 31193 came to rescue from Exeter. The Class 25’s were frequently found on the Tiverton Jct – Acton milk tanks, often in pairs. Arrivals in October were 25171 & 25172 & 25238, again all internal transfers from Cardiff. The continuing shortage of power on the WR allowed many strangers to reach deep into WR territory, the 18.00 Riverside – East Usk frequently featuring pairs of Class 25’s, November 6th produced 25276 & 25089, 14th had 25193 & 25073 whilst on November 22nd the 20.40 Bradford – Plymouth parcels arrived behind 25134. During November two local freights became derailed, on 2nd the 6B59 14.57 Ponsandane - Riverside saw a number of wagons derailed at Totnes, 25219 was the locomotive, whilst on 27th the 7B16 13.35 Bridgwater - Gloucester freight with 25152 in charge saw wagons derailed at Highbridge. 25274 damaged in a collision at St Blazey was towed to Bristol on January 2nd behind 50018, later heading north attached to 46053 & 08668/937. 1975 was a busy year for Laira's Class 25 fleet with considerable turnover of the locomotives, there were still some internal Western Region transfers, additionally other locomotive transfers were of an inter-regional nature. A total of seventeen Class 25's were transferred in, and thirteen were transferred out during 1975. Laira allocated 25063 made an historic trip on a gloriously sunny February 26th when it traversed the long closed Barnstaple - Ilfracombe line with an inspection saloon. This would be the last train to travel the route. The line had closed to regular passenger traffic from October 5th 1970. Dismantling of the route took place shortly afterwards. Departing in May were 25171 & 25172. 25220 stands at Plymouth Laira on May 25th 1975 in very shabby condition. Within a matter of days it will be moved to Derby Works for overhaul, which will include the sheeting over of the gangway doors and a fresh coat of blue paint. During July it will be outshopped and will return to Laira. Departing in June was 25238. Arrivals in July was 25220. 25094 removed seventeen milk tanks from the Hemyock branch on August 20th, the Unigate Factory having recently converted to road haulage, the only tanks remaining were for emergency use until the branch closed completely on October 31st. In the early hours of August 28th the Laira breakdown crane was brought to Exmouth by 25098 to assist in the rerailing of dmu 51090 which had run through the buffer stops on the previous afternoon. Also on this date the 7B71 04.45 Riverside - Barnstaple behind 25091 suffered wagon derailment between Lapford & Eggesford. August 30th saw 25220 stationed at Par to provide assistance to the heavy summer trains working over the Newquay branch. Assistance was given to the 08.45 Newquay – Manchester behind 45010, returning with 1063 & twelve coaches prior to both working the 13.22 Newquay – Paddington. Arrivals in August were 25077, 25091, 25092, 25093, 25094, 25096, 25098. departing were 25274, 25275, 25306, 25326, 25327. The locomotives in the 25091 - 25098 batch were some of the most transferred locomotives on BR at this time, as it was they all would only remain at Laira for three months before heading off to the Scottish Region. A fine view of 25096 at St Erth on September 15th 1975. 25096 was only at Laira from August to October 1975. The six wheel milk tanks featured with 25096 heark back to another time. October 4th found 25093 & 25096 in charge of the 09.35 Penzance – Wolverhampton working throughout. With the rundown of the Western's starting to accelerate, the use of a pair of 25's on such a working would have at the time seemed an abomination to a diesel hydraulic enthusiast, but now in hindsight the thought of a pair of Class 25's, and non-boilered ones at that, with a good sized train running through those Cornish valleys, up and down the Devon banks, across Somerset, then up Filton Bank, racing around the Cotswolds before the challenge of Lickey - oh happy memories for those fortunate enough to have ridden those services, the like of which can now never be repeated. Four duties from St Blazey shed were now handled by Class 25’s. One covered trips to Bodmin Road/Wadebridge then clay trains between Liskeard and Moorswater, with an afternoon run to Hayle Wharf. Two locomotives worked between St Blazey & Drinnick Mill, including trips to Parkandillac, Pontsmill & Goonbarrow and Carbis & Meledor Mill. The fourth covered control trains in the St Blazey area. Also included was a round trip night working to Exeter. On November 21st 25217 was noted between Aller Jct and Newton Abbot hauling/propelling a number of test vehicles. A rather grubby 25225 stands in the yard at Barnstaple during a crew change, the locomotive has just returned from duties on the Meeth branch. Mainline running was the order of the day on January 24th when 25158 & 25167 rescued failed 47027 on the 13.30 Paddington – Paignton service, all three were replaced at Exeter. During 1976 the turnover of Class 25's dropped, with four machines departing and four arriving - the departing machines were sent out of the Western Region whilst the new arrivals at Laira were from within the Region. Departing in January was 25063 & 25168. From 1976 the withdrawal of the remaining Class 52's gave the Class 25's more work. On a summer Saturday St Blazey had a pair booked to run light engine to Penzance, work to Plymouth and back, and then return light engine to St Blazey. The Penzance foreman commented that they would avoid it if possible and try and cover the turn with a Class 46. At this period they also worked the morning Paignton - Plymouth train and late afternoon return. This was normally about five coaches and a single Class 25 would struggle over Dainton. In July and August the load was increased to about 8-10 and it was often worked by a pair of Class 25s This was probably their finest hour on regular passenger work in the West Country. Arriving in May was 25052, 25080 & 25227. In the Exeter area Class 25 diagrams included the afternoon Chard Jct – Exeter milk train, then a local evening Exeter – Newton Abbott passenger, using the stock from a Waterloo service. A pair of Class 25’s also handled the overnight St Blazey – Temple Mills freight as far as Exeter. Departing in July was 25169. Its July 1st 1976 and soon to be transferred 25169 is arriving at Exeter with the 07.35 mixed train from Barnstaple. An unidentified Class 25 assists Western Class 52 No.1001 and its train across Pinnock viaduct towards Plymouth on July 31st 1976. Kingmoor’s 25200 arrived at Exeter on August 13th with the regular freight from Severn Tunnel Jct, the next day it was in use on passenger services over the Barnstaple branch! (There is a view of this working at Crediton towards the bottom of this page). Also noted passing through Exeter this day was the Nottingham – Paignton behind 25211 & 25029. At the end of August 24054 & 24142 were pulled from the deadlines at Basford Hall and sent to the WR for further use as carriage heating units. On August 31st they arrived at Exeter as part of a milk train, their eventual destination being Laira. Looking like its just been pulled from the deadlines at Basford Hall, 24142 sits at Laira on September 19th 1976. Arriving in October was 25063. Departing in October was 25227. Christmas at Tyne Yard found Laira's 25063 & 25220 a long way from home, laying over after having worked the 3E07 21.40 Bristol - Sunderland parcels of December 23rd. 25217 with its non-standard numbers manouevres around Exeter signing on point sometime during 1976. The wasteground behind the locomotive was a storage point for the motor vehicles brought in by train, and prior to their distribution to local car dealers. On May 9th a reshuffle of the WR carriage heating units took place, with unit TDB968008 (24054) moved from Penzance to Plymouth, whilst TDB968009 (24142) moved from Plymouth to Worcester. The WR witnessed a number of double headed Class 25’s during the summer season. On July 16th the 08.50 Birmingham - Paignton used 25159 & 25101, also returning with the ecs. A Plymouth - Old Oak Common parcels ran with 25225 & 50029. July 23rd brought 25284 & 25250 on the 12.20 Birmingham - Newquay as far as Plymouth. July 30th found two services behind double headed Type 2’s, the 09.47 Nottingham - Paignton used 25187 & 25269 whilst the 12.20 Birmingham - Newquay had 25264 & 25210. The local Round Table in the Barnstaple area ran a special on August 29th from Barnstaple to Meeth. The ten coaches were ‘top & tailed’ by 25223 & 25052! A Plymouth - Milan Polybulk train of Sept 2nd headed by 47510 and a Class 25 required the assistance of the fire brigade near Totnes after the Type 4 caught fire. The train eventually went forward behind the Class 25 and a Peak, with 47510 dumped at Newton Abbot awaiting removal to Crewe Works. The next day 25129 headed the 09.20 Paignton - Nottingham arriving at Birmingham some ninety minutes late, being replaced here by 46046. One can but wonder what this locomotive sounded and what the crews thought about it as it journeyed north, unfortunately losing time on this lengthy journey. The West Country hosted a number of enthusiast specials during the early part of October. On October 9th 40081 & 40084 worked a special from Paddington to Exeter, here 25052 & 25223 took over for the run to Paignton, where D1062 was waiting for the short trip down to Kingswear. For the return trip the same locomotives worked their respective sections as outwards. A week later on October 16th 40081 & 40083 worked a railtour from Paddington to Newton Abbott, here 33017 & 33022 worked a round trip to Par, with the Class 40's regaining the train at Newton Abbott for the run back to London. It had been planned to have a Deltic to work this railtour to Newton Abbott but their blacklisting at this time saw the Class 40's substituted. 25052 & 25223 pass Marsh Barton on October 9th 1977 having just taken over from 40081 & 40084 at Exeter. The Class 25's will work the special down to Paignton. Transfers during 1977 were few, during October 25063 moved to Crewe, followed by 25220 in November. The details of this view are not known, but 25052 & 25223 were paired together several times on railtour duty. Perhaps this is one of the 1977 tours they handled. Transfers during 1978 led to a net loss of one locomotive to Laira's Class 25 fleet. All the transfers, in & out, were inter-regional. Arriving in March was 25206 & 25207. Departing in March was 25216 & 25217. Its March 5th 1978 and St Blazey depot hosts a mixture of motive power; 37142, 25052 & 25216 and a Swindon DMU. The arrival of 37142/37207/37267 at St Blazey in late 1977/early 1978 began the decline of the Class 25's in Cornwall. The Class 37's proved popular with their increased power and weight. March 5th was also a memorable day for the West Country as the Deltic Ranger railtour saw 55003 Meld haul the train from Paddington to Paignton. Western haulage had been planned from Paignton to Dartmouth but a washed out bridge on the preserved line prevented the planned itinerary from taking place. As a fine substitute 46003 made a round trip from Newton Abbott to Par before handing back the railtour to 55003 for its return to London. For the haulage enthusiasts amongst the railtour participants the use of 46003 may have been significant, it was damaged by fire four months later and subsequently withdrawn. 25215 was allocated to Laira from October 1975 to May 1978. It is seen here on the headshunt at Laira, date unknown. During April more Class 25 turns at St Blazey were turned over to other types, with Class 37/46/50 frequently replacing the Type 2’s. 37142 & 37267 were crew training on the St Blazey - Newquay line, whilst a former Class 25 turn, the shunting at Hayle Wharf was now in the hands of a Penzance Class 08. Arriving in May were 25048, 25057 & 25058. Departing in May were 25170, 25215 & 25224. 25080 had been scheduled to move to Crewe but the transfer was cancelled, so 25080 spent one last summer in the West Country. Par station basks in the warm summer sun of May 25th 1978, the beginning of another holiday season. All is quiet with the exception of 25052 which is positioning itself ready to assist soon-to-arrive 50001 and its terminating freight train (see below). 50001 is seen at Par on May 25th 1978 with a freight from Drinnick Mill. It had arrived on the mainline and required the assistance of 25052 to reach the yard, 25052 is just visible at the other end of the train. The use of 50001 on a working such as this is very unusual, possibly it was on restricted working from Laira. July 22nd found Newton Abbott host to 25276 & 25282 bringing up an ecs working from Paignton, previously used on an ex Birmingham working. A surprising visitor on the 15.55 Bristol - Plymouth parcels on September 7th was Haymarket based 25011, which worked as far as Exeter, replaced here by 25155. However it continued its westward march by working the 19.30 Exeter - Paignton!. September 23rd found 25245 & 25275 working a Birmingham New Street - Paignton relief . On September 30th a railtour reached the West Country which had started from Derby the previous evening and travelled via the London area (West Ruislip - Greenford - Drayton Green Junction - Hanwell) before gaining the Western Region mainline, then proceeding via Bath and Bristol to Plymouth in charge of 25074 & 25073. At Plymouth 25080 took over for the run down to Bodmin General, then on to Boscarne Junction and Wadebridge. At noon 25080 started the long journey home, returning the railtour to Plymouth where 25073 & 25074 were waiting to take over for the lengthy ride back to the Midlands. At Exeter St Davids the railtour took the former LSWR route via Salisbury and Basingstoke to Reading before heading north. For the hardy enthusiasts who survived the whole trip 25073 & 25074 provided them with just over 780 miles of memories, with another 76 miles provided by 25080. 25080 at Bodmin General on September 30th 1978. Passenger service over the former GW line from Bodmin Road to Boscarne Junction and the former LSWR line from Boscarne Junction to Wadebridge and Padstow ended on January 30th 1967. But eleven years later some of the rails are still in place and many of the structures remain. The ultimate destination of the railtour was Wadebridge. In this view 25080 waits for departure back to Derby. No regular passengers have used the station for eleven years but still much of it remains, though the rusty rails are a warning to its gloomy future. The station buildings and the goods shed will survive but the rest will eventually disappear under a housing development. The above railtour was one of the very last trains to reach Wadebridge. After the withdrawal of the passenger services in 1967 the line had remained open for freight traffic. The last freight operated on September 2nd 1978, the line being completely closed two days later. The final special passenger train ran on December 17th 1978 when a DMU made several trips from Bodmin. In better times there was occasional fertiliser traffic to both Wadebridge and Bodmin. The St Blazey - Wenford Bridge trip was normally a Class 08, reversing at Bodmin Road, Bodmin General and Boscarne Junction, however if there was a heavy load to come out some of it would be left at Boscarne Junction and collected later by a Class 25. On the return from Wadebridge the tour recessed at Liskeard allowing a trip (to the pub) on the Looe branch. 50020 passes by 25080 and its train while stopped at Liskeard. 25052 pauses at Honiton with the returning milk wagons from Chard Jct, a heavy downpour has just ended, the Class 25 waits for an up train to pass. The year closed out with bad weather in the Midlands and North East. Walsall station, as usual, was flooded after torrential rain on December 29th. Heavy snow over the New Year plagued services with delays and faulty equipment made life even more difficult to maintain the timetable. In the West Country Exeter proved to be a graveyard for frozen up locomotives, with temperatures reaching down to –13C most things simply froze up. The 00.05 Paddington – Penzance was reported sixteen hours late at Plymouth, 50046 had left Paddington 150 minutes late continuing to loose time throughout the journey, before expiring completely at Brent, with 47106 coming to the rescue. The train was cancelled at Plymouth with Penzance passengers connecting with the 10.30 from Paddington, arriving at Penzance some eighteen hours late! At Exeter the local services were cancelled with the dmu’s frozen solid. The diesels fared little better with eighteen frozen up locomotives including 25052, 25206/225/263, the only serviceable machine being 46020, which had been equipped with steam lances for the freeing of pointwork and rodding. Whimple on the former LSWR route is six miles east of Exeter, an occasional freight serviced the Whiteways cider factory and/or the flow of aggregates. On an unknown date 25057 is running round its train. The track has been singled and the old down line was the main running line, with the former up line used as a run around loop. The Class 33 is on the 11:00 Waterloo-Exeter service. There were no reallocations to the Laira Class 25 fleet during 1979. January 30th found 25048 providing heat for the 18.05 Plymouth – Cardiff, with 50008 as the train engine, both were removed at Exeter by 45049. On April 23rd the 7B19 17.05 Truro - St Blazey freight behind 25225 & 25207 became derailed between Truro & Burngullow, the locomotives remained on the track. The next day 25048 came to the rescue of 50045 after it failed on the 12.00 Plymouth – Paddington at Exeter, the Class 25 going as far as Westbury. 25048 & 25107 pass through Pinhoe with the Chard Junction - Exeter milk on April 21st 1979. The Class 25's worked several milk trains in the West Country, the one featured in this photograph, the working from Hemyock to Tiverton Junction and the tanks from Torrington/Lapford. The tanks would be added to the milk trains bound for London. 25053 & 25057 pass Dawlish Warren on May 7th 1979 in charge of the 13.30 Paddington - Penzance. Two views of 25206 in the Exeter area. Although the left view is not dated 25206 was outshopped from Derby Works after a general repair in May 1979. The right hand view is at Exeter City Basin on May 7th 1979. This working was frequently a Class 08, depending on the load. Photograph courtesy Ian Mawson (left) & Peter Lovell (right). In several of the pictures taken alongside Exeter St Davids station the waste ground was frequently used for the storage of new cars. These cars would come into Riverside Yard on double deck car-carriers (certainly in later years) and be unloaded in the sidings situated between the station and the freight avoiding lines. They would then be driven around to the piece of waste ground that had formerly been the site of the coaling stage before distribution to the dealers. With the River Exe on one side and railway running lines on the other it was viewed as a safe location by the standards of the time. Some of the traffic came from Allerton or Speke suggesting Vauxhall's, but may have included other locations. Additionally with regard to the above two views the Exeter gasworks had stopped production in 1971 following the introduction of North Sea gas and was demolished in 1973. Road tar had been produced as a by-product of the gas process. Once the gasworks had closed the tar was brought in by rail tankers. This was normally a Class 08 turn so the use of 25206 was quite rare. The warning notice needs to be updated! 25052 heads a line up of Class 25's by the turntable at St Blazey during June 1979. Another view of the line up headed by 25052 in the yard at St Blazey. And like their diesel hydraulic predecessors the paintwork in these machines is not holding up too well. Hidden behind the Class 25 on the right is a Class 37. June 30th found the 10.20 Paignton – Manchester at Exeter behind 31165 & 25048, both replaced here in favor of 47030. After many years of work in and about the East Midlands the transfer of 25155 to the West Country brought a whole new set of workings. Of trips to the furthest south-west station in the country, local passenger workings along the scenic coastline of Devon & Cornwall and dealing with the Devon banks on china clay workings. Its the summer of 1979 at St Austell and 25155 needs a touch-up to the cab front paint job. On October 2nd 25135 worked a special Bristol – Plymouth to cover a late running service from the North West. Dual braked, boiler equipped 25048 and an unidentified Class 31 approaches Paignton, date unknown. 25048 was allocated to Laira during May 1978 and with 25057 was the last to leave, during November 1980. So presumably this picture is within that timeframe. Photographer not known at this time. 25052 at the east end of Exeter St Davids, September 14th 1979. 25052 has one more year left in service, it will be withdrawn from Laira and go directly to Swindon for breaking up. It's October 20th 1979 and the Wirral Railway Circle's 'Atlantic Coast Express' has stopped at Torrington on its way down to Meeth. In charge are Laira allocated 25052 & 25223. The railtour also visited Meldon Quarry. Photograph collection of webmaster/Pete Slagel. The end of the line for 25223 and its railtour at Meeth on October 20th 1979. Unusual duty befell 25225 & 25080 on April 12th, taking over at Exeter from 31304 & 31163 on a Paddington – Meeth special, the Torrington – Meeth section top and tailed due to lack of run round facilities at Meeth. The special also covered the line to Meldon. A gloriously sunny April 12th at Meeth greets 25080 with 25225 on the rear of the railtour. An overcast May 31st 1980 finds 25058 accelerating away from Teignmouth with an Exeter bound service. This will be the last summer in the West Country for 25058. At the end of the summer timetable severe inroads were made to Laira's Class 25 allocation. During October 25058, 25206 & 25207 were transferred away whilst 25052, 25223 & 25225 were withdrawn. Laira kept one Class 25 for the St Blazey – Truro – Penzance trip working, by November 3rd this too had been taken over by a Class 37. On October 5th a charter from Alfreton reached Exeter behind 45061 with 25223 & 25080 taking the train forward to Barnstaple. 25080 moved to Longsight during October. During November the last two Class 25s were transferred out - 25048 to Bescot and 25057 to Longsight, bringing to a close a nine year stint for the Laira allocated Class 25s in sunny Devon & Cornwall. The loss of Laira's allocation saw them beat a retreat from any further Cornish workings, whilst their most westerly appearances would now be Exeter arriving on freight turns. The picturesque branch running 38.75 miles from Exeter St Davids to Barnstaple provided the Class 25's with some regular passenger work. Although the boiler fitted examples were the preferred locomotives for the branch, there were frequent visits by Laira's non-boilered machines, with occasional visitors to Exeter also filling in on these services. On the Barnstaple line there were two regular passenger turns. The first was the 04:05 Exeter - Barnstaple that was two coaches and newspaper and mail/parcels traffic loaded into some 4 wheel Fruit D vans retained for this turn. This returned as the 07:50 Barnstaple mixed (restricted to 45mph?). The other turn was the four coach set that worked the early Salisbury - Exeter service. This came in with a Class 33 which would then work the 10:10 to Waterloo and the set would work the 15.55 Exeter - Barnstaple using a Class 25. On it's return from Barnstaple a Class 33 would take over which would form the last service to Salisbury/Basingstoke. From about 1976 this became a regular Class 31 or 33 turn. There was often doubleheading on the Barnstaple line if there was an unbalanced freight working. A regular on Sundays would be a Class 33 and Class 25 on the 11:15 Exeter - Barnstaple with the additional locomotive for use on an afternoon milk train. The Barnstaple branch diverged from the mainline at Cowley Bridge Junction. Here 25057 joins the mainline at Cowley Bridge on June 18th 1979 with the 07.50 Barnstaple - Exeter. After leaving the mainline the first station reached is Newton St Cyres, 4.5 miles from Exeter. On November 25th 1978 25069 & 25058 pass the station with the 07.46 Barnstaple - Exeter mixed service. In this case the two passenger coaches are sandwiched between several parcels/mail coaches. The 13.40 Exeter - Barnstaple pauses at Crediton on the afternoon of August 14th 1976. The locomotive leading the train is 25200 which was not one of the local Laira allocation, presumably it was 'borrowed' for this service prior to its return north! Lapford station is almost midway between Exeter and Barnstaple, on August 22nd 1976 25080 pauses whilst working the 14.20 Exeter - Barnstaple. A weight restricted bridge at Umberleigh prevented the larger Type 4's from reaching Barnstaple except in an emergency. 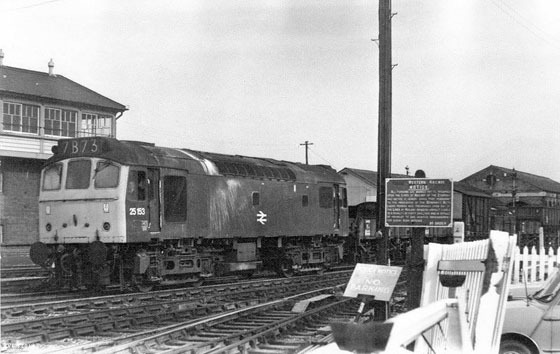 The Warship class locomotives were allowed through to Barnstaple, when the final examples were withdrawn it was left to the newly arrived Class 25's to take over the heavier workings. During the early 1970's this included milk traffic from Torrington and Lapford, sand or coal from Fremington Quay near Bideford, cement and general freight at Barnstaple and ball clay from Meeth on the old Torrington - Halwill line. 25080 has arrived at Barnstaple with the 14.20 from Exeter. It is in the process of being uncoupled from its train in order to complete a runround before heading back to Exeter with the 15.55 service. The railway services in North Devon suffered during the era of the Beeching closures, the former London South Western (LSWR) route to Torrington closed to passengers during October 1965, the former Great Western line to Norton Fitzwarren closed in October 1966 whilst the former LSWR route to Ilfracombe survived a little longer, eventually succumbing during October 1970. The above view of 25080 and the view below of 25215 show the railway line still being in place west of Barnstaple Junction station in the direction of Bideford. In the view below of 25215 the view looks roughly northwest across the Taw estuary to Chivenor & Braunton. 25215 stands on the remains of the line to Bideford, Torrington & Meeth. At the time of writing this (2010) the line ends almost exactly where 25080 is standing above with only one platform in use. All the line westwards has been taken up and turned into a pathway of some sort. 25215 runs round its train at Barnstaple on September 18th 1977 having recently arrived with the 11.10 from Exeter. The railways of Devon & Cornwall present the railway traveller with several opportunites of an ocean view with probably none as spectacular as the length of line that runs between Dawlish Warren and Teignmouth. This route was opened during 1846, engineered by Isambard Kingdom Brunel and routed along the coast to save costs with the added bonus of its use as a tourist attraction. Whilst it is most definately the latter, the lengthy seawall has presented the railway with a major item of continuous maintenance, the seawall being vulnerable to major winter storms and rising sea levels. In particular the storms of the winter of 1872/1873 created major breaches in the wall. Currently the wall does not have a wave-reflecting curve whilst sea spray and overwash often cause damage to the line and in particular Dawlish station. 46004 at Dawlish Warren on June 16th 1979 with the 08.27 Cardiff - Penzance. In the distance is Dawlish Warren station opened in 1912 which replaced the original Warren Halt opened in 1905 and was one quarter mile south of the present station. For the westbound traveller the ocean vista opens up as the trains passes Langstone Rock, if the day is sunny another remarkable feature of this section of line becomes obvious - the colour of the rocks and cliffs is a bold red! The redness comes from its ferric oxide content affecting the layers of desert alluvial fan (New Red Sandstone deposits laid down in the Permian era), sandy breccias, with fragments of hard Culm sandstone and some quartz pebbles, all of which dips gently southeastwards. On August 19th 1983 eastbound 45054 with the 09.50 Plymouth - Crewe enters the expansive cutting built to push the line through an outcropping of the colorful rock which pushed out into the ocean. The photographer is standing on the top of Langstone Rock. Heading westwards 25115 passes through the broad cutting on June 11th 1979 with the 14.10 Exeter - Paignton. The edge of Langstone Rock is to the right. 25115 was always allocated to the LMR, at the time of this view it was allocated to Toton and no doubt borrowed by Exeter before its return north. At Toton its seaside visits were more likely to be Llandudno, Skegness or Great Yarmouth rather than South Devon! Langstone Rock and the pedestrian footpath along the top of the seawall have allowed generations of railway enthusiasts (and others) to capture the passing railway scene. Most will probably remember it on the balmy dog days of summer, either on holidays to the West Country or enjoying a day trip from home towns far away. 25080 is only a couple of months out of Derby Works, its paint still retains much of its factory finish as it is seen here on September 1st 1980 working the 14.20 Paignton - Exeter, it had previously worked the 11.04 Exeter - Paignton. 25080 was allocated to Laira from May 1976 to October 1980. The next day, September 2nd 1980 25206 is in charge of the 11.04 Paignton - Exeter, returning later with the 14.20 Exeter - Paignton. 25206 spent most of its career allocated to LMR depots, its only time away from the LMR was during its time allocated to Laira, from March 1978 to October 1980. In the above view the tide is in and reaches right up to the seawall. During the construction of the line Brunel believed that the construction of the groynes perpendicular to the seawall would stop the drifting of the sand and cause the beach to be build up, which over time would prevent the sea from reaching the seawall. Many of the groynes are featured in the view below, but alas the build up of the beach did not take place and from time to time the seawall takes a battering from the winter storms. During the summer months some of the Laira DMUs were doubled up to cope with the influx of holidaymakers. This would lead to a locomotive and stock turn with about three or four return trips between Exeter and Paignton/Newton Abbot during the course of the day (see views above!). With so many main line trains on a summer Saturday to Paignton there were few local services until the evening. A regular Class 25 turn in the mid 1970's was working the stock off the 15:00 Waterloo - Exeter to Newton Abbot for servicing. The Class 33 that had worked the train in would return on the last train to Salisbury formed of the four coaches and a van that had arrived earlier in the day on the early morning service from Salisbury. This stock normally worked to Barnstaple and back in the afternoon. The 15:00 Waterloo stock would form a service to Newton Abbot calling at Dawlish and Teignmouth. On weekdays it departed at about 20:15, forming a connection off the 17:30 Paddington - Penzance 'The Golden Hind'. On Saturdays this train was timetabled later, so the Waterloo stock followed the Leeds - Plymouth, departing at about 20:45. Although the line from Exeter to Newton Abbot is flat the eight coach load was challenging for a Class 25. The Class 25 locomotive hauled trains from Exeter to Paignton only operated in the summer months when some of the DMUs were doubled up. At the end of the summer timetable, in those days after the third week of September, the stock needed to be returned to Newton Abbot. This was achieved by combining the four coaches with the 15:00 Waterloo set making twelve coaches of about 410 tons. Although this happened only once a year it would be a good candidate for the heaviest passenger train booked for a single Class 25. The sun is barely breaking through the clouds as 45032 heads up the eleven coach 07.48 Penzance - Liverpool on May 27th 1980. Beyond Dawlish the railway line continued to hug the coast as seen in this dramatic view of 45054 hauling the 10.05 Paignton - Leeds on September 10th 1983. The red tint of the rocks is clearly visible, even on this cloudy day. 45004 heads westwards along the seawall towards Teignmouth on April 8th 1984 with the 11.15 Paddington - Plymouth, presumably deputising for a failure somewhere down the line. When the Class 25's were allocated to Laira they were frequently seen working one of the more recognisable freight flows in Devon & Cornwall - clay traffic. There are two main types of clay. Ball clay was extracted at Meeth and the area around Marland in North Devon and Heathfield on the former Teign Valley branch from Newton Abbot. Ball clay is a bit like plasticine and was conveyed in four wheel wagons with tarpaulins. Some of this traffic went to Cornwall for export with china clay. However the more familiar and major traffic flow was in Cornish China Clay. This was extracted from the area north of Par and St Austell, using high pressure hoses to force the clay out of the ground, this extraction method creates the moon-scape landscape in that area. The slurry then runs to the driers where it settles and then dries into a fine powder. It was then loaded into the four wheel wagons equipped with the raised bar for the tarpaulin, which ensured that any rain ran off the wagon and kept the clay dry. For the ball clay it was better to keep the clay damp so a tarpaulin with a puddle of water on it would be fine. The clay driers were mostly located on the two former branch lines to Newquay. The line from Par to Newquay remains open, the line from Burngullow near St Austell was closed to passengers but remained open for freight traffic to Parkandillack with a number of driers, including Drinnick Mill on the way. The main flow of traffic was from the driers to Carne Point near Fowey where the clay powder would be loaded into ships for export. This required a run-round at Lostwithiel for traffic from Par. China clay also went in hoods to Etruria, Stoke on Trent for the pottery industry and slurry to Sittingbourne for the paper industry. There was also a very heavy weekly train made up of Polybulk wagons to Zurich in Switzerland. This train frequently loaded to 1,000 tons and utilised a Class 47, frequently a Class 25 would assist to Newton Abbot, this was probably the heaviest train regularly worked by the Class 25's in the West Country. In the 1990s the flow to Irvine in Scotland started in the stainless steel tanks (silver bullets). 25058 and about thirty of the clay hoods passes Tywardreath on April 26th 1979 working a Fowey - St Blazey empties. A lengthy train of clay hoods, running wrong line, approaches Lostwithiel station behind 46016 sometime during 1979. To the left is 37267, whilst behind the wagons hauled by 46016 are the Penzance vans in charge of a Class 50.